Opis ebooka Owning A Cat - Tiziana M.
In order to decide what cat to get, you first need to do a little research into the different breeds that are available. Just like any other type of animal, different breeds can mean different mannerisms and behaviors. There are many different breeds to choose from and what type of cat that you will chose will depend largely on if you are looking for a cat to have in your home as a pet or one that you can breed.Listed below are many of the popular and common cat breeds that might aid you in your decision as to what cat is going to be the best fit in your life. There is a wealth of information throughout this book that that will help you decide what kind of cat to get or even if a cat is right for your life right now.You will find information on how to deal with a new kitten, how to groom your cat, how to figure what to feed your cat, and much more useful information that is going to help prepare you for your new addition. 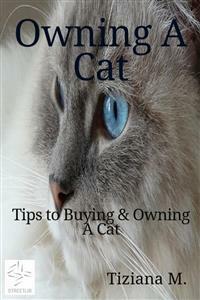 The information in this book is also great for those who already have a cat but have a few questions here or there. Opinie o ebooku Owning A Cat - Tiziana M.